Representing all endangered historic bank buildings in Texas, the Bloomburg State Bank was organized in 1908 and moved into its newly-constructed three-story building in 1918. It was and remains the tallest building in Cass County, and at one time the bank served counties in Arkansas, Louisiana and Texas. At one time the building also housed the telephone office and a masonic lodge. After the owner of the building gave it to the City in 1968, the City later considered it a liability and planned to demolish it. Concerned citizens purchased the building for $1.00 to prevent its demolition. Vacant since the early 1980s, the building continues to deteriorate. Historic bank buildings are architecturally and culturally significant landmarks because they are often located in the center of town and represent the economic promise of a prosperous community long ago. In the mid-20th century, suburbanization and the demand for drive-through banking led many banks to abandon their historic buildings. 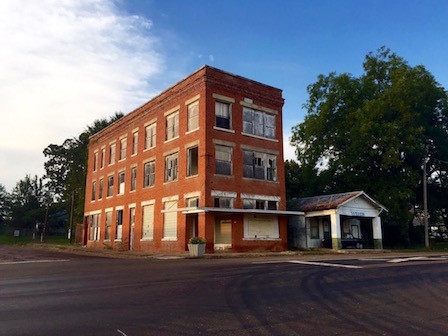 Stripped of their purpose and their prideful place in the community, vacated historic banks like this one in Bloomberg often become the victims of neglect. This building remains endangered as of August 2016.